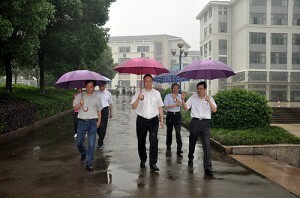 In the afternoon of 2013-06-016 , Zheng Jianbang, Vice Chairman of Central Committee ofDemocratic Revolutionary Party came to Changzheng College for a survey, accompanied by Yujian , vice chairman of the Provincial Democratic Revolutionary Committee , as well as Mr. Chen Yuguo , the chairman of board directors and the Party secretary of the college, and Mr. Wei Xianchao , the president of the college. 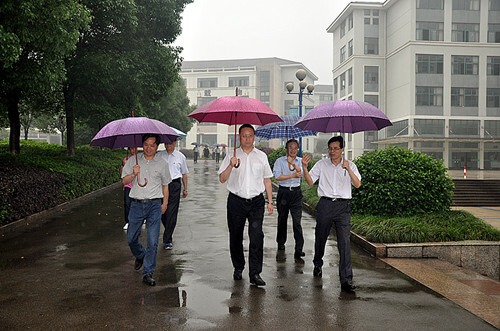 Mr. Zheng Jianbang firstly visited the college campus, the college stadiums, the library and other educational facilities, and then came to the students apartments for a survey of the civilization construction. Afterwards, in the college lounge, he listened to the college work report. Mr.Chen Yuguo firstly addressed a welcome speech, then President Wei XianChao gave a detailed introduction about the development process of the college, the teaching orientation and philosophy , and the achievement obtained by the college so far . 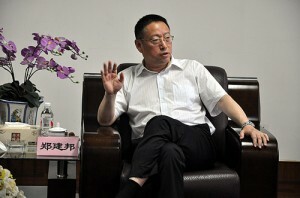 After hearing reports from president Wei, Vice Chairman Zheng Jianbang highly praised the achievements made by the College. He pointed out that the college has not only trained a large number of useful talents for the society , made great contributions to the social development , but also set a very good image for the Democratic Revolutionary Party in the society. It is also a good example for the DRP to serve the society wholeheartedly. At the same time, he said, focusing on education is a responsibility for democratic Parties , Changzheng college is a very good practice base for the DRP. As to the further development of the college, he said, the DRP Central Committee will give full support and help. The college must continue to bear the social responsibility with its own education style, actively carry out international cooperation and exchanges , have a good understanding of the development trend of the global higher education , and try to made Changzheng a high standard private college.